Daniel Mellis send in this useful info concerning surface cleaning rusty tools; which, ahem, some of us may have a small number of. 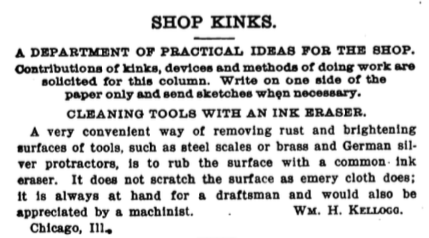 Originally this idea was published in the column “Shop Kinks” from Machinery in 1907. It’s a wonderfully provocative title — I may have to steal it — a refreshing take on usual “Tips and Trick”. A kink, in this sense, is a new aspect, twist, or take on something. A very convenient way of removing rust and brightening surfaces of tools, such as steel scales or brass and German silver protractors, is to rub the surface with a common ink eraser. It does not scratch the surface as emery cloth does; it is always at hand for a draftsman and would also be appreciated by a machinist. Compared with other methods of rust removal, the ink eraser is convenient, especially for small areas, and it does not require any noxious chemicals like naval jelly or even any liquid. As noted by Kellogg it also does brighten surfaces. Caution should be exercised as ink erasers will scratch softer metals like cast iron. The biggest difficulty is actually locating them. Common enough in the 90s and probably early 00s, they are no longer a standard item in office supply stores. The site www.jetpens.com carries the Tombow Mono Sand Eraser, as well as the Seed Sun Dolphin 3 Electric Eraser for which you can get 60 count ink eraser refills. These are relatively small, the larger size strips for heavy duty electric erasers, #72, were discontinued about 5 years ago. Boxes are still available on ebay, starting at $59, which works out to about $5 per strip. Some of the descriptions state they are for abrasion testing; a specialized industrial use may justify the price. 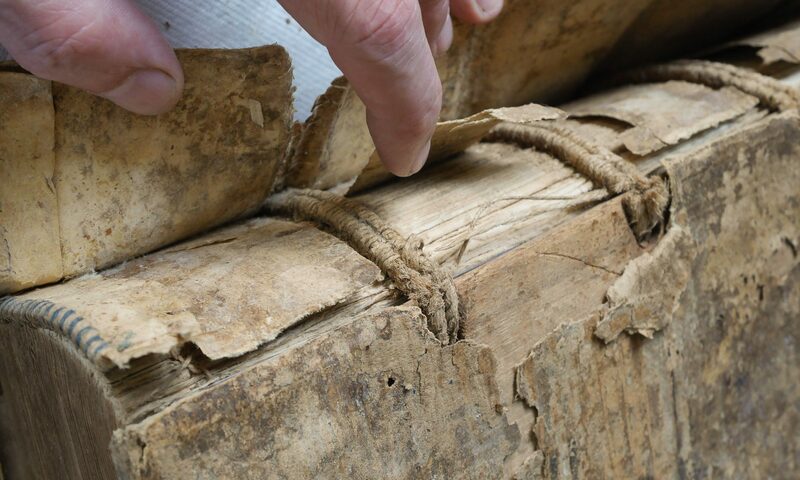 Perhaps small drafting supply houses might have some in a corner somewhere. When cleaning a straight edge, I used one of the larger strips; the in process shot shows its effectiveness. 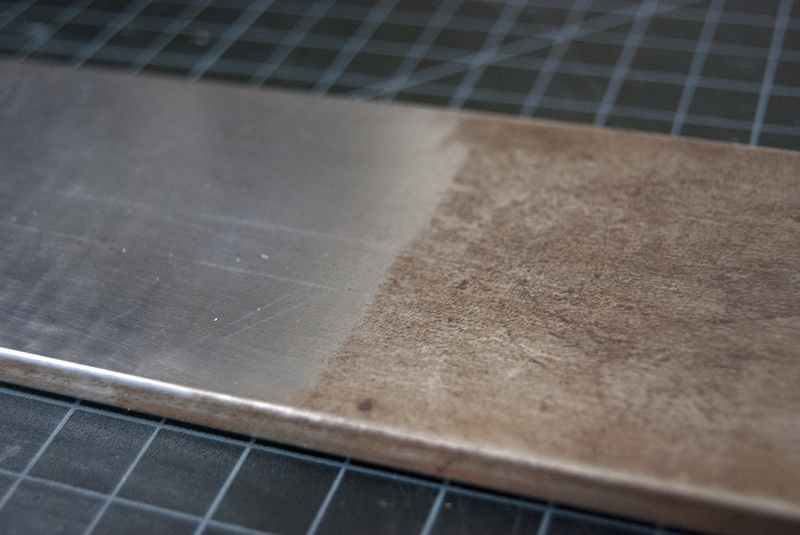 The electric erasers can leave a pattern on the surface due to variable reflectiveness, but that is easily removed with a quick polish with something like Mother’s Mag and Aluminum Polish. Doesn’t work. Better to try before suggesting. Best remains fine steel wool, if needed a touch of type cleaner and/or light machine oil. The image he sent sure looks like it works, no?